Start in Sonora, CA and head east on CA 108 all the way until it junctions with US-395 in the town of Sonora Junction - 79 scenic miles in all. This route delivers breathtaking vistas of snow covered mountain peaks, mountain meadows, wild flowers, wild life, water falls, and trees of every description. Panoramas so beautiful, they look painted. This is strictly a summer road as it is closed in winter. You can still see snow at the end of summer near the mountain peaks. Photo contributed by a visitor in July 09: "This is the top of Senora Pass, approximately 10,000 ft."
The pavement quality is good for a two lane mountain road. The road is steep, narrow and very twisty near the pass. Overall this is not a beginner's road. Steep and narrow, with sheer drop offs. Awesome ride for an experienced rider. There are no stores or gas station on the east side of the pass, and 18 Miles from the west junction to the nearest town Bridgeport. One recommendation for food - Strawberry ski lodge is a great lunch stop. on September 20, 2009 5 out of 5 members found this review useful. I live in Sonora and do this ride several times a year. It never gets old. I've always told my ridin' buddies, it's prettier than Yosemite, with ALOT less traffic. I'll have to disagree about amenities though. Kennedy Meadows is open through the Summer, as well as Dardenell Resort. Kennedy's has a lodge and bar/diner. Dardenell has a great diner, store, and gas pumps,, as well as cabin rentals. on July 24, 2009 4 out of 4 members found this review useful. I rode this route in July 09 but, I started from Hwy. 395. It was an exciting ride to say the least. Starting out there are many sharp curves and some that will surprise you, with switchbacks coming just over a small rises. It is well suited to a sportbike but, can be fun on a tourer. You have to be careful as there are some surprising turns. After you get over the summit the road gets better with more sweeping turns. This was by far one of the best sections of my trip from Alaska. Beautiful scenery and fantastic views. on July 26, 2014 3 out of 4 members found this review useful. on July 3, 2014 3 out of 3 members found this review useful. We took this road by accident, intending to take 120 through the park. And boy are we glad we did! Endless twisties and next to NO traffic. Summer only riding over 10,000' Sonora pass. Wow, what a road. THIS is the way to ride through Yosemite --- skip all the RV's! on September 29, 2010 1 out of 3 members found this review useful. A GREAT ride. Just experienced 9/2010 as i took it as an alternative to Tioga Pass road back through Yosemite (heading back to CA 395) and have to say it's probably the best all around "short" road I've ever been on. It has killer views coupled with straights, sweepers, sharp turns, twisties, drop-offs, etc...quite technical on the eastern end. I did it from West to East and that made the technical end even more exciting because it was on the downhill side! Anyway, if you get the chance do the ride...I can't imagine anyone being disappointed. on August 3, 2010 1 out of 2 members found this review useful. This is a great ride. Happened on it by luck, as I got chased out of Yosemite NP due to a controlled burn that got out of hand. Was told by a local to take this road. Glad I listened, excellent scenery, lots of twisties, some serious grades with tight curves. on June 19, 2017 0 out of 0 members found this review useful. Fantastic ride with amazing views, countless twisties, high elevation coolness and way less traffic than 120 going through Yosemite. I ended up taking this route somewhat by accident. I was riding from Reno back to the SF Bay Area and didn't want to deal with traffic in Yosemite NP. I took the west bound route of 108 from 395S and was greeted by a very steep climb up the eastern Sierras and a GREAT ride all the way home. Highly recommend! Head East from Us 395 up through all the twisties to Sonoroa pass you'll be worn out from the twisties, but you'll have a huge smile on your face. on June 19, 2010 0 out of 2 members found this review useful. 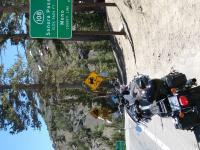 Indeed one of the best High Sierra rides, spring & summer only. Check to make it is open. July 2009 road in very good condition so navigating a brisk pace is made to order. East side has great twisties with some fun rising switch-backs. West side terrific too. Hwy 120-Tigoa Pass to the south and Hwy 4-Ebbets Pass to the north are also spectacular, however, Sonora may have a slight edge for Scenic Grandeur. Have made this ride several times & you can definatley savor the flavor and mouth waters just thinking about the next time. Super Scenic with breathtaking waterfalls, Red, Brown and Grey Granite Peaks usually capped with snow, Blooming Mtn Meadows. Time permitting for an unbelievable ride, criss-cross the Sierra's using all three passes..Tioga, Sonora and Ebbetts. Doesn't matter which end you start or what direction you take. on September 27, 2008 0 out of 1 members found this review useful. Just rode this last weekend. This is by far one of the greatest rides in NorCal, starts out with fast sweeping turns and beautiful scenery and just gets better, the road becomes a roller coaster of sharp well banked corners and steep up and down grades. As you reach the pass every turn brings on a new and awe inspiring view of the Sierras.